General Hospital (GH) spoilers reveal Samantha “Sam” Morgan (Kelly Monaco) held the key to the upcoming story of the “Two Jasons”. Helena Cassadine (Constance Towers) gave Sam a penny at the reading of her will, stating that Sam and any child of Alexis Davis’ (Nancy Lee Grahn) is only worth one cent. Sam brushed it off as Helena jabbing at her one last time, just like telling Sam she is cursed – maybe she should have paid closer attention to the detail of the coin. As Patient 6 (Steve Burton) is heading back to Port Charles, Sam is struggling with her current relationship with the man everyone knows as Jason Morgan (Billy Miller). It will be interesting to see how the powers that be (TPTB) are going to explain the twin storyline and how it will alter history, especially since they are already forcing longtime GH fans to forget what they have seen and known – now saying Jason was actually at the reading of Helena’s will, which we all know never happened! 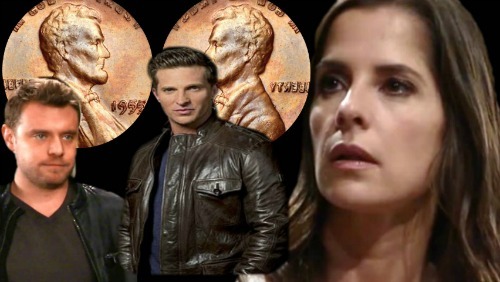 General Hospital spoilers tease that the penny was an omen of what was to come and what already happened. It has been suggested that the coin will not only have two identical faces, but the year will be the year Susan Moore (Gail Ramsey) gave birth to the twin boys, Drew and Jason – 1974. GH spoilers also tease that under the year there will be another clue indicating that the coin was minted in New York, the same place Susan gave birth. It is clear the penny was Helena’s way of taunting Sam, revealing her involvement in the twin twist to come. At least this is how GH writers will subtly alter General Hospital history to fit their new narrative. General Hospital’s Sam has always prided herself for her great sleuthing skills and viewers can bet that she will be kicking herself for not paying closer attention to the “gift” Helena left behind, especially since Helena always has an ulterior and sinister motive in everything she does. How do you think Sam will react when she discovers she held the key to the twin mystery all along? Be sure to tune into ABC’s General Hospital (GH) to catch up on everything happening in Port Charles right now and you will not want to miss when the tale of two Jasons is exposed. Check CDL General Hospital spoilers often for updates, news, rumors and spoilers!